Around two weeks after mating, a clutch of eggs is formed inside the female sea turtle. Left alone, with the job of egg laying, she drags herself out of the surf and onto the beach. If you are lucky enough to catch a sea turtle right at this instant, you will see her put her head down and touch her nose to the sand. 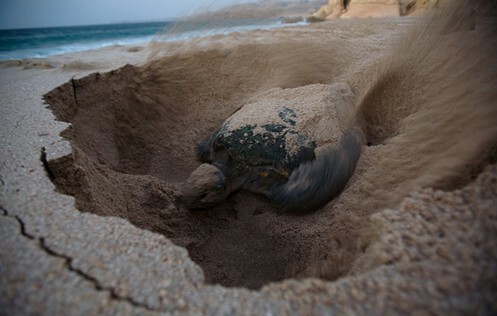 Some people think turtles do this to smell the sand – to make sure they are on the right beach. Other researchers have a different theory. Sea turtles have ferromagnetic crystals in their brain and also in their nose! These crystals are believed to be the turtles’ “internal compass” to help them migrate through the ocean. It is believed that when a sea turtle touches her nose to the sand, she is sensing the earth’s magnetic field. By using her nose as a compass, she is able to make certain she is on the correct nesting beach! 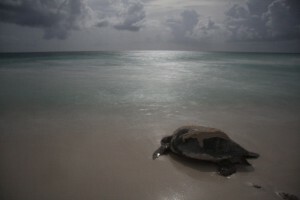 Sea turtle nesting often occurs at night, underneath the stars and the moon. Some advantages of nocturnal nesting include, no threat of overheating in the sun and fewer predators on the beach at night. As the female sea turtle moves herself up onto the beach, her flippers, normally used for swimming, push and pull her heavy body across the sand. One flipper moves forward and then the other. This leaves a type of zipper-like track in the sand. Tracks help researchers locate nest sites and also identify what species of turtle that was on the beach! 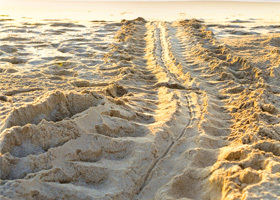 For example, loggerheads use alternating flipper strokes while green sea turtles leave symmetrical tracks in the sand. After expending much energy crawling up the beach, the mother turtle will find a suitable nesting spot, hopefully above the high tide line. She will then begin to dig a body pit by pushing away debris, vegetation and soft sand with her flippers. Once she moves the top layer of soft sand she uses her rear flippers to dig the nest cavity in the wet compact sand. She uses her back flippers just like a shovel, scooping up sand from the hole and flinging it to the side. When complete, the nest cavity will be shaped like an upside down light bulb and over a foot deep! Next, contractions will start to occur and soft, wet, white, ping-pong ball sized eggs will begin to drop from her cloaca 2 to 3 at a time! On average, depending on the age of the turtle and the species, the female sea turtle will lay between 50-100 eggs. This large number ensures increased survival rates for the population. After egg laying is complete the female will begin to fill in the nest cavity with sand, to protect them from predators and from drying out. She again uses her rear flippers to carefully cover the eggs, while patting the sand down to make a tight seal around the egg chamber. Next, she uses her front flippers to fling around soft sand and vegetation to disguise the nest site. Then, after circling the entire body pit area and camouflaging the nest site to her liking, the female will crawl down the beach to make her return to the sea, never to visit her nest again. The entire nesting process is exhausting and usually lasts between 2 and 3 hours! 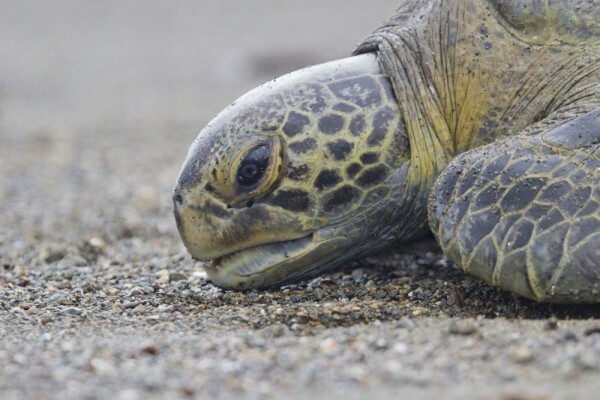 In two weeks, after the next clutch of eggs has formed inside the female sea turtle, she will return again to the beach to lay another nest – all over again.